Our website allows you to learn more about our lodge, it's origin and what we have planned for the future. It also allows you to learn more of the history of the Orange Order, King William and other important events throughout Orange History. Keep up to date by visiting our events page as we offer different activities throughout the year, a great way to meet other members of the lodge. This year as part of the South Antrim Combine a group of districts in the Lagan Valley area will head to Aghalee. There will be approx. 3500 orangemen and band members on parade in Aghalee on 12th July 2011. Before you go don't forget to visit our shop as we offer a wide range of official Hillsborough District LOL No. 19 clothing for purchasing. The Twelfth of July celebrations in Northern Ireland comprise the largest public festival on the island of Ireland. It's a massive day out for many families who come along to watch the Orangemen, Orangewomen, and bands, have a picnic in the Twelfth field and catch up with friends. The festivities mark the anniversary of the victory of King William III over King James at the Battle of the Boyne in 1690. Annually, hundreds of thousands of people participate and come to enjoy the colours, music, pageantry and tradition on show at parades which are organised throughout Northern Ireland and also at Rossnowlagh, County Donegal . 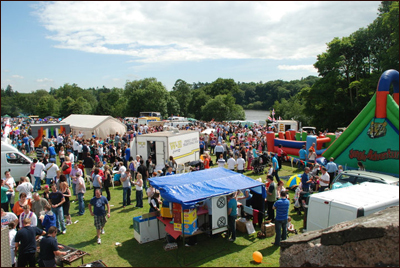 Hillsborough hosts the Twelfth celebrations every seven years and is part of the South Antrim Combine, a group of 7 Orange Districts in the Lagan Valley area. We have joined together to celebrate the Twelfth since 1908. There will be around 3,500 Orangemen and band members on parade in Hillsborough on 12 th July 2010. Parades are very much part of our Orange heritage – the first recorded parades were on 12 th July 1796, although the parading culture was already well established by that date. However, parading is not a uniquely Orange phenomenon. There's Carnival in Rio, Mardi Gras in New Orleans , 4th July across the United States of America, Bastille Day in France, and St. Patrick's Day in Dublin. • Are a unique display of pageantry and colours, with the wide range of differing Lodge collarettes, sashes, Lodge banners and band uniforms on display. Display the musical talents of our bands, ranging from flutes bands of all descriptions, to brass bands, accordion bands and pipe bands, not forgetting the unforgettable sight and sound of the Lambeg drums and fife players.